German Samoa ( German: Deutsch-Samoa) was a German protectorate from 1900 to 1914, consisting of the islands of Upolu, Savai'i, Apolima and Manono, now wholly within the independent state Samoa, formerly Western Samoa. 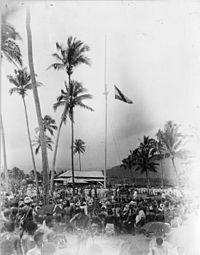 Samoa was the last German colonial acquisition in the Pacific basin, received following the Tripartite Convention signed at Washington on 2 December 1899 with ratifications exchanged on 16 February 1900. It was the only German colony in the Pacific, aside from the Kiautschou concession in China, that was administered separately from German New Guinea. In 1855 J.C. Godeffroy & Sohn expanded its trading business into the Pacific following negotiations by August Unshelm, Godeffroy's agent in Valparaiso. He sailed out to the Samoan Islands, which were then known as the Navigator Islands. During the second half of the 19th century German influence in Samoa expanded with large scale plantation operations being introduced for coconut, cacao and hevea rubber cultivation, especially on the island of 'Upolu where German firms monopolised copra and cocoa bean processing. However, when a dissident Samoan matai (chief) exceeded the limits of his considerable tolerance, Solf stepped in assertively, pronouncing that “... there was only one government in Samoa,” and it was him. “German rule brought peace and order for the first time ... Authority, in the person of the governor, became paternal, fair, and absolute. Berlin was far away; there was no cable or radio.”  Energetic efforts by colonial administrators established the first public school system; a hospital was built and staffed and enlarged as needed, and Samoan women were trained as nurses. Of all colonial possessions of the European powers in the Pacific, German Samoa was by far the best-roaded;  all roads up until 1942 had been constructed under German direction. The imperial grants from the Berlin treasury which had marked the first eight years of German rule were no longer needed after 1908. Samoa had become a self-supporting colony. 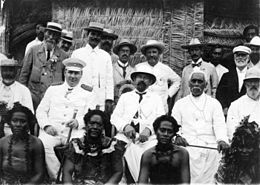 Wilhelm Solf left Samoa in 1910 to be appointed Colonial Secretary at Berlin; he was succeeded as governor by Erich Schultz, the former chief justice in the protectorate. The Germans built the Telefunken Railroad from Apia onto the Mount Vaea for transporting building materials for the 120 m high mast of their Telefunken wireless station, which was inaugurated as planned on 1 August 1914, just a few days after the begin of World War I. At the behest of Great Britain the colony was invaded unopposed on the morning of 29 August 1914 by troops of the New Zealand Expeditionary Force. Vice Admiral Count Maximilian von Spee of the German East Asia Squadron gained knowledge of the occupation and hastened to Samoa with the armored cruisers SMS Scharnhorst and SMS Gneisenau, arriving off Apia on 14 September 1914. He determined however that a landing would only be of temporary advantage in an Allied dominated sea and the cruisers departed. New Zealand occupied the German colony through to 1920, then governed the islands until independence in 1962 as a League of Nations Class C Mandate  at first and then as a United Nations Trust Territory after 1946. ^ a b Masterman, Sylvia (1934). 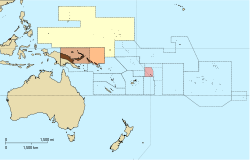 "The Origins of International Rivalry in Samoa: 1845–1884, Chapter ii. The Godeffroy Firm". George Allen and Unwin Ltd, London NZETC. p. 63. Retrieved 15 April 2013. ^ Suamalie N.T. Iosefa; Doug Munro; Niko Besnier (1991). Tala O Niuoku, Te: the German Plantation on Nukulaelae Atoll 1865-1890. Institute of Pacific Studies. ISBN 9820200733. ^ Laracy, Hugh, ed. (1983). "The 'Ownership' of Niulakita, 1880-1896". Tuvalu: A History. Institute of Pacific Studies, University of the South Pacific and Government of Tuvalu. pp. 196–197. ^ Rowe, Newton A (1930). Samoa Under the Sailing Gods. New Zealand Electronic Text Centre, Victoria University of Wellington. Putnam. p. 11. Retrieved 25 February 2010.